Okay I seem to have totally abandoned blogging in favor of pinterest. So if you'd like to see a little of what I've been doing click on this link to see my board about body flowers or maybe here and you can see some party ideas or here and find all my musings on the color pink. It's pretty much endless with pinterest. A kind of testimony to the endless ability of the human mind to codify and categorize. 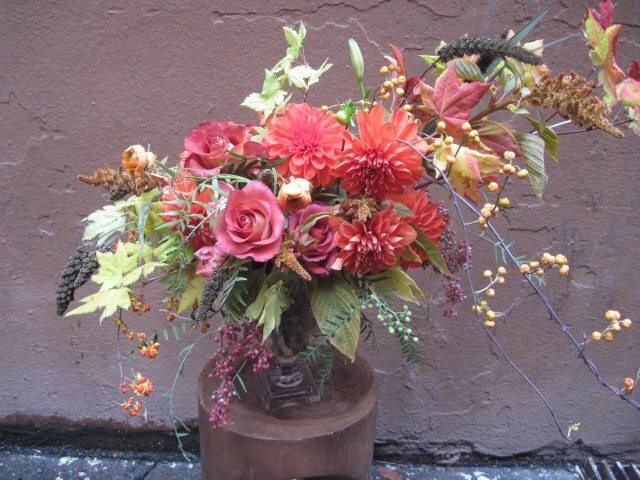 In the meantime here's a lovely bouquet Sarah made yesterday - it's an ode to autumn with maple leaves, and three kinds of berries. Can you name the three kind of berries? But really why I wanted to show you this, besides the fact that it's totally gorgeous, is that it has the last of the locally grown dahlias. So, join me in saying farewell to these beauties and thanking them for yet another season of their awesomeness. We love dahlias and are sad to see them go.